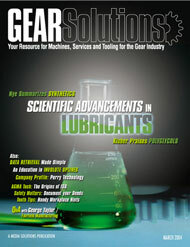 In modern-day gear technology, the lube oil used is an important element of the gear’s overall design. 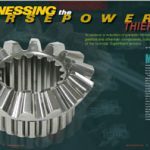 Increasingly stringent requirements for large enclosed gear drives–of the kind used in the wind power sector, for example–and the base materials industry now necessitate the use of synthetic oils. 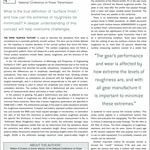 Although the feedback regarding the use of synthetic gear oils based on polyglycol has been positive, there continues to be a residual uncertainty concerning their usability in terms of elastomer seals, and a possible performance restriction due to their water solubility. 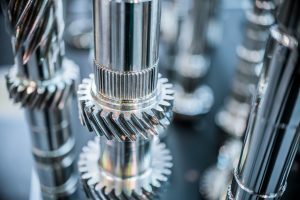 The favorable friction behavior of polyglycols has meant that these oils have become widely adopted for lubricating worm gears. 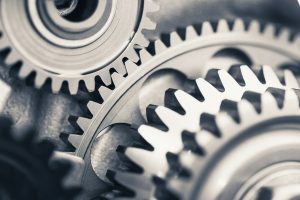 This paper intends to show that polyglycols also constitute a fully viable solution for use in large gears, which may even be more advantageous than using the polyalphaolefins. For the tests described below, one mineral oil and two different polyglycol gear oils, whose properties are explained in Table 1, were selected. 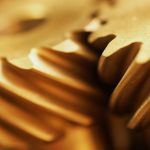 Whereas the properties of mineral oil are known, and the behavior of polyalphaolefins in the ranges of relevance for gear construction is comparable to that of mineral oils, polyglycols exhibit properties that differentiate them from mineral oils and polyalphaolefins. The basic raw material used for producing the various synthetic lubricants, which include the polyalphaolefins and polyglycols, is ethylene, which is obtained by cracking crude oil. The polyalphaolefins are produced by polymerization of the olefin 1-decen, which in turn is created by oligomerization of ethylene. Chain length, branching and positions of the branches in the molecule determine the viscosity, viscosity-temperature behavior, and the pour point of the liquid. When ethylene and propylene react with oxygen, we obtain ethylene oxide (EO) and propylene oxide (PO), from which the polyalkylene glycols are produced by means of polymerization. The mixing ratio between EO and PO, plus the oxygen bonded in the chemical structure, crucially affect the behavior of polyglycols. 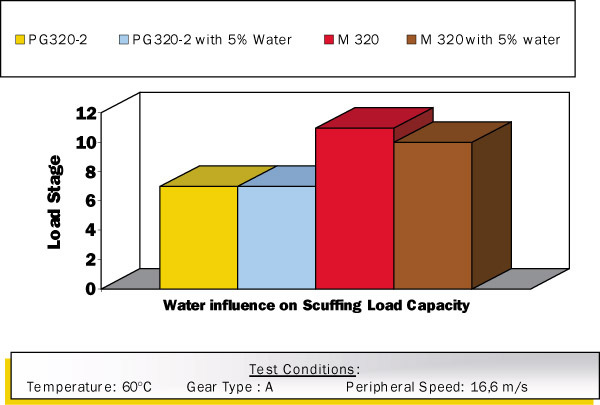 Since the gear industry predominantly uses polyglycols with an EO/PO ratio of 50:50 to 60:40, which exhibit very similar behavior, only these types will be dealt with here. The polyglycols featuring this composition are also generally referred to as water-soluble polyglycols. The principal cause of the distinctive behavior of polyglycols, however, is the bonded oxygen, which lends the polyglycols their particularly polar character. By reason of their structure, polyglycols absorb a greater or lesser amount of water. Firstly, this behavior is dependent on the ratio of ethylene glycol to propylene glycol, and secondly, a distinction also has to be drawn between absorption due to admixture of water, water-solubility, and absorption due to atmospheric moisture, or hygroscopicity. The water solubility of polyglycols is determined by their content of ethylene oxide groups. Whereas pure propylene glycols, EO/PO 0:1, are not water soluble, but can certainly absorb up to 3 percent of water, polyglycols can be unrestrictedly mixed with water as from an EO/PO mixing ratio of 1:1. This miscibility is limited only by the temperature. At a higher temperature, the solubility decreases in dependence on the EO/PO ratio. In the case of polyglycols with an EO:PO ratio of 1:1, this temperature lies at 60 to 65ƒC. Polyglycols’ characteristic of forming a hydrate envelope is so marked that polyglycols absorb moisture from the air, or are hygroscopic. This hygroscopicity, too, is influenced significantly by the type of polyglycol involved. While pure polypropylene glycols can absorb a max. 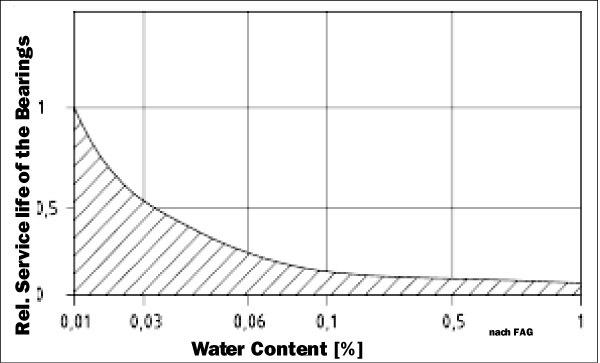 3 percent of water, the figure for 1:1 types is up to 10 percent at ambient temperature and a relative humidity of 80 percent. However, absorption from the air is substantially influenced by the relative humidity, the temperature, the surface, and the time involved. The above-mentioned balancing concentration is unlikely to be reached in enclosed gears, since the oil surface is very small in relation to the oil volume. In addition, the standstill times are often very short, so that the amount of exchange occurring is small. By reason of this property, polyglycols are accordingly supplied with water contents of 500 to 2,000 ppm. 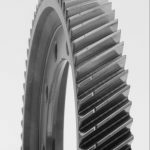 The seal materials customarily used in gears are elastomers based on NBR and FKM. 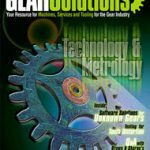 While the use of NBR elastomer seals in combination with mineral oil and polyalphaolefins is regarded as non-critical, the use of polyglycols always raises the question of compatibility with the elastomer being used. 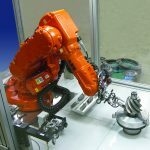 The static tests conducted in the past for assessing the seal compatibility of various elastomers with the operating liquids used are progressively being replaced in the gear construction sector by testing under dynamic conditions. 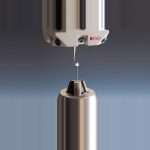 FZG Micro-Pitting TestThe tests listed are met by many of the products currently on the market, both polyalphaolefin-based and polyglycol-based types. Restrictions on performance due to the presence of water are uncommon these days. This is dealt with in more detail below. 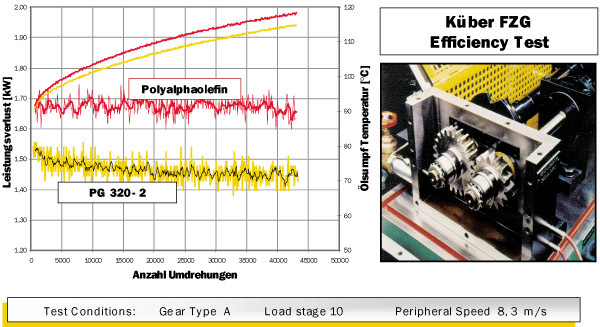 The polyglycols used as gear oils exhibit good water solubility, thanks to their EO/PO ratio of 1:1. The anti-corrosion properties, which can be assessed using a variety of test procedures, are accordingly of particular interest. The anti-corrosion properties of lube oils are determined with the stirring procedure using a round steel rod . 300 ml of the oil under test are mixed by stirring with 30 ml of distilled water, corresponding to 10 percent, at 60ƒC, for a period of 24 hours. The corrosion occurring at the immersed round steel rod is graded from zero to three. 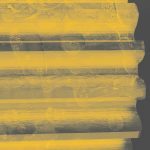 Mineral oils and polyalphaolefin oils achieve the required anti-corrosion properties by means of suitable corrosion inhibitors. Table 1 also evidences excellent anti-corrosion properties for the polyglycol gear oil under test. SKF EMCOR Test ISO 11702 The SKF Emcor Test  was developed for assessing the anti-corrosion properties of lubricating greases. They are graded on a scale of zero (no corrosion) to five (10 percent of the surface corroded). By reason of the test cycle involved, which features a standstill time of 140 hours, it is also of particular interest for assessing polyglycols. The tests performed with 2 percent and 5 percent water exhibit no signs of corrosion (Table 2). By comparison: for lubricating greases, the rolling bearing industry accepts a corrosion rating of one. FAG’s diagram shows that even very small quantities of water, in the range from 300 to 1,000 ppm, significantly affect the bearing’s lifetime. Possible variations in dependence on the base oil used, however, are not differentiated. In addition, the Institute for Machine Elements at Aachen Technical University (IME), in a study dealing with the influence of moisture at grease- and oil-lubricated bearings , points to causal connections in terms of dissolved and free water, indicating that more favorable lifetime results can be anticipated with dissolved water contents. 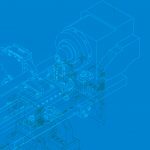 Since water-soluble types are used with polyglycol gear oils, it is of interest to investigate possible deleterious influences in the presence of water for these types. 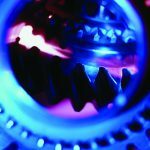 The FE 8 test rig developed by FAG  serves not least to investigate the anti-wear properties of lubricants under extreme mixed-friction conditions. This test, developed for lube oils, and lasting more than 80 hours, is conducted at a test temperature of 80ƒC. Under these conditions, the k-value is in the range of 0.04-0.06. The targets are rolling element wear of less than 30 mg and cage wear of less than 100 mg. 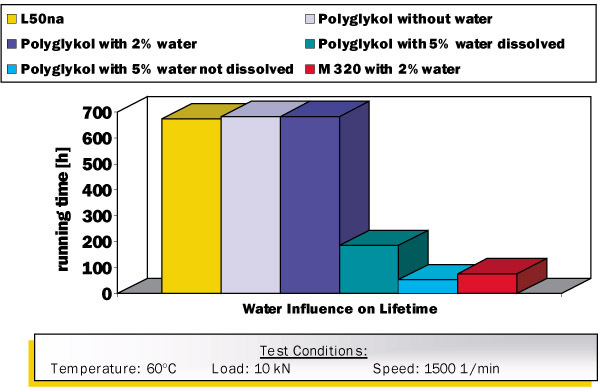 The results shown in Figure 2 compare the performance of a polyglycol of ISO VG 320 without water, and the performance of the same polyglycol after admixture of 1 percent and 5 percent of water. 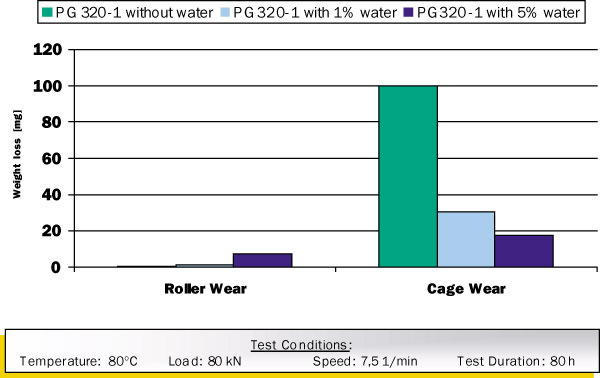 Even when 5 percent of water has been admixed, the rolling element wear is still significantly below the limit value of 30 mg. For cage wear, even lower wear rates were determined. In order to determine possible influences of the lubricant on the bearing’s lifetime, life tests are required. In conjunction with the IME, life tests were accordingly conducted on a radial-bearing test rig. The studies at the IME were designed to discover what influence water has on lubrication with polyglycols. For comparison purposes, studies were also carried out with a mineral oil. The grooved ball bearing 6206 used is loaded with a spring washer component exerting a defined 10 kN. The speed is 1,500 1/min. Under these EHD conditions, a bearing lifetime of 673 h was determined, which due to the kappa value of > 4 applies both for the mineral oil and for the polyglycol (Figure 3). The results (Figure 4) show that when 2 percent of water is admixed (20,000 ppm), there is no measurable influence on the bearing’s lifetime. Random-sample testing with 5 percent of water in the polyglycol revealed a 70 percent reduction in bearing lifetime if the water is dissolved. 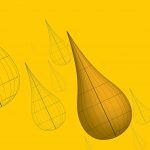 If the water is not dissolved, only 8 percent of the mathematical lifetime is reached. The mineral oil with 2 percent reaches 10 percent of the calculated lifetime in the random-sample test. The result thus agrees with those reported by the rolling bearing industry. From the studies carried out by Bayerd–rfer  at the FZG regarding the influence on the tooth profile load-carrying strength of operationally entailed changes to the lubricant, it is known that the toothing, too, can be prematurely damaged by water in the oil. Bayerd–rfer’s basic studies, too, were conducted with mineral oil, so that no conclusions can be drawn in regard to polyglycols. In initial trials, the scuffing behavior of polyglycols with a water content of 5 percent was accordingly determined in an FZG Special Test, A10/16,6R/60. The test conditions were selected so as to ensure that when the 10-mm-wide wheel set is used the sump temperature adjusts itself to max. 75ƒC when the wheel is driving. By comparison, a mineral oil with likewise a 5 percent water content was also tested. For both oils, it was known that they pass the standard FZG Scuffing Test with a load stage of > 12. 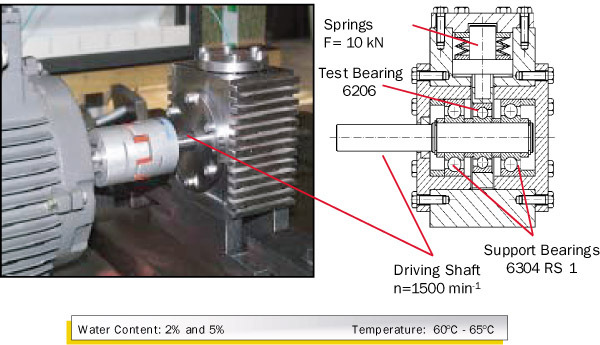 The smaller gearwheel width of 10 mm instead of the customary 20 mm gearwheel width thus made it possible to run the test under extreme scuffing conditions, which meant that scuffing could already be anticipated at a relatively low load. The tests revealed that the polyglycol gear oil without water fails in the test by reason of scuffing in load stage seven. By contrast, the mineral oil reaches the scuffing load stage by reason of its additive content in load stage 11, as expected. The experiments with water admixture, conversely, show a changed picture. As in the reference run, the damage occurs in load stage seven for polyglycol with 5 percent of water. The mineral oil, by contrast, has already failed in load stage 10 (Figure 5). For the polyglycol, there are no detectable changes afterwards. For the mineral oil, the change is slight. Polyglycols score in terms of their very low friction coefficients. This favorable behavior is of particular utility for worm gears. 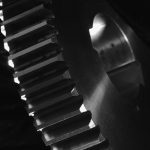 In the case of spur gears, it is frequently argued that these low friction coefficients produce only slight improvements or none at all. In the Kl¸ber FZG Efficiency Test, the power loss is determined with Toothing A at the standard circumferential velocity and high torque. 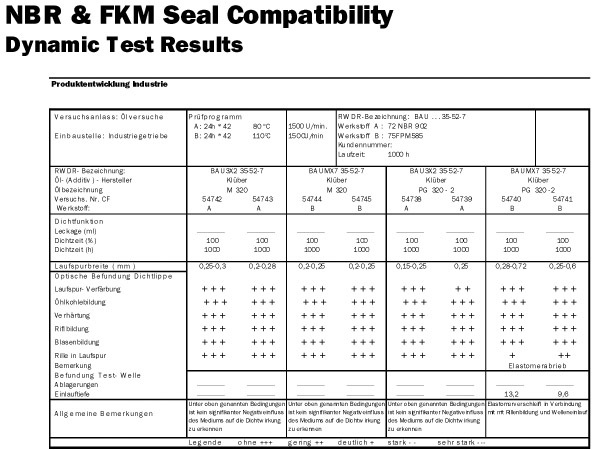 The dynamic seal compatibility tests presented show good compatibility with NBR and FKM elastomers for the polyglycol tested as well. The tests conducted over a period of 1,000 hours produce results comparable to those for mineral oil. Since in gear construction it is predominantly water-soluble polyglycols which are used, the influence of water on polyglycols was examined. The results obtained show that the oils tested are still able to meet CLP requirements, even with a high water content. 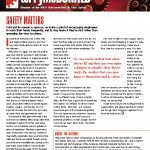 This does not mean that lubrication with water-content polyglycols should be permitted in all cases. The results merely demonstrate that the effects for polyglycols in conjunction with water need not be regarded as more critical in terms of function than for mineral oils. If water penetrates into the system unintentionally, polyglycol might even offer slight advantages. 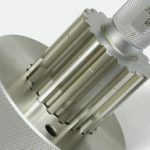 In addition, the low friction coefficient of polyglycols offers an option for achieving extended oil lifetimes thanks to lower gear sump temperatures. The power consumption involved can be measurably reduced. 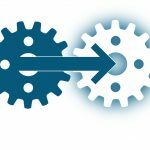 van de Sandt, N., Gold, P. W., Loos, J., Assmann, C.
Mechanisch-dynamische Pr¸fung auf dem, W”lzlagerschmierstoff Pr¸fger”t FE 8.
is director of Marketing & Application Technology and can be reached at 49 89 7876-253 or ulrich.mann@klueber.com). The company¼s Web site is [www.klueber.com].